Gamma-Ray Bursts (GRBs) are the most explosive events in the Universe since the Big Bang. For the short time that they are visible, they outshine the rest of the gamma-ray sky. The energy each burst emits may be up to 1054 erg (where 107 erg is 1 joule) if the emission is isotropic; if the radiation is beamed towards us, then the total energy is reduced by a factor of (solid angle of beam)/4π. A GRB detected by BATSE, the Burst And Transient Source Experiment, on-board the Compton Gamma-Ray Observatory (CGRO). GRBs were first discovered accidentally in the late 1960s by the Vela satellites. These satellites belonged to the United States Air Force and were launched as part of an effort to enforce the new nuclear test ban treaty. This treaty prohibited the testing of nuclear devices in the atmosphere or space and the Vela satellites were designed to monitor any such explosions. However, rather than identifying any illegal testing, the satellites detected non-terrestrial gamma-ray events - i.e., from outside our atmosphere - and, so, GRBs were discovered. Between 1991 and 2000, BATSE detected 2704 GRBs, as shown in the diagram below. It can be seen that they are fairly uniformly spread over the entire sky, indicating that they are either nearby and clustered around our position, or they do not originate in our own Galaxy. In 1997, BeppoSAX detected the first X-ray afterglow within a GRB error box (GRB970228). An optical transient was also found, fading within a week (HST press release). The identification of GRB970228 with a host galaxy at a known distance (redshift of 0.695) confirmed the cosmological origin of GRBs. GRBs last between a few milliseconds and several minutes. There appear to be two populations, 'short' bursts, with durations peaking around 0.3 seconds and 'long' bursts, which last around 30 seconds, with the 'dividing line' between the groups being ~ 2 seconds. Durations of GRBs detected by BATSE. Peaks in the number of bursts detected can be seen around 0.3 and 30 seconds. When a massive (> 10 Msun) star reaches the end of its life, a supernova may occur, leaving behind a compact object - either a neutron star or a black hole, depending on its mass. It has been suggested that when an even more massive star (possibly > 40 Msun) collapses, the explosion is even more extreme, with the energy output being ~ 100 times greater. These have been termed 'hypernovae' and may be the route to forming the longer (> 2 second) bursts. The GRB itself is likely to be formed when a narrow jet of highly relativistic plasma erupts from the collapsing star; the jet is most likely a by-product of the rotation of the star. An alternative suggestion for the formation of GRBs is via the merging of two neutron stars. Stars in a binary system orbit their common centre of mass. As they orbit, rotational energy is converted to gravitational energy, causing the stars to spiral towards each other and, eventually, merge, forming a black hole. A simulation of such a merger can be seen here. Facilities such as LIGO (Laser Interferometer Gravitational Wave Observatory) may be able to detect the gravitational waves emitted from these events. Neutron star mergers have been suggested as a way to explain the shorter (< 2 second) GRBs. 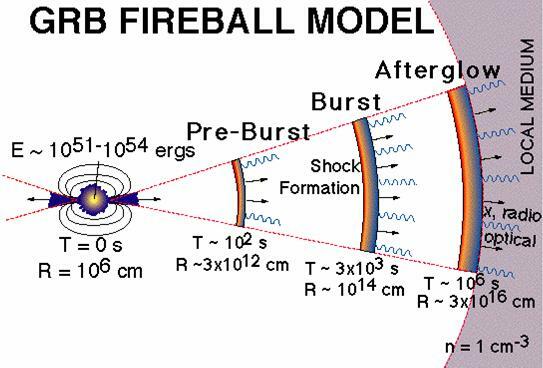 Regardless of the progenitor, the favoured model for GRBs is the Fireball Model, in which the emission is separated into 2 components: the prompt outburst phase (strong gamma-ray and X-ray emission) due to internal shocks in the relativistic blast-wave, followed by the afterglow (strong X-ray, optical and radio emission) which arises from the cooling fireball and its interaction with the surrounding medium. Before the launch of Swift, only longer bursts have been investigated, since commands had to be sent to the relevant satellite to point it in the correct direction, which this takes time. Swift is designed to be much more autonomous and, when it has detected gamma-rays, automatically slews to the position of the GRB within seconds. 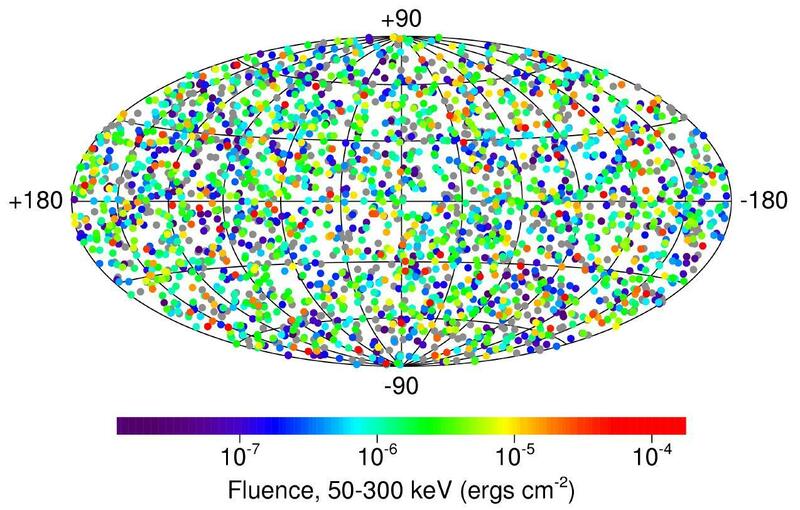 Although the initial emission appears at gamma-ray energies, many bursts are also detected in the X-ray, optical and radio bands - the so-called afterglow emission. Swift is a multi-wavelength mission, with three instruments on-board - the BAT (Burst Alert Telescope), XRT (X-ray Telescope) and UVOT (Ultraviolet and Optical Telescope) - enabling the study of the initial burst and afterglow emission over a broad range of wavelengths. After a GRB has been detected and localised, follow-up observations with ground-based telescopes can occur. Among these are included the Faulkes and Liverpool robotic telescopes.